Are chunky woven wall hangings still invading your home? How about chevron prints? If you said “yes” to either of the aforementioned, once-massive home decor trends, we hate to break it to you, but you’re long overdue for a fresh start and a total decor rehaul. And we highly recommend you start with Etsy’s recently released trend guide. A few of these trends are surprising (wait, tie-dye is coming back? ), while others we’ve seen coming for some time (hello, again, wallpaper plastered on anything but walls). Regardless, Etsy’s 2019 home decor trends guide is all the home inspo you need to take the leap and Marie Kondo all the tired, dated decor you currently have in your home. 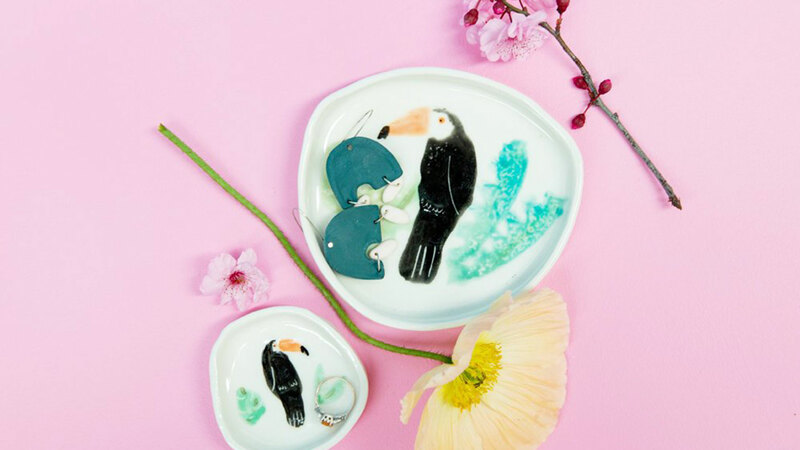 Etsy calls this the season of maximalism, which they state includes standout fixtures, bold patterns and vibrant colors. Let’s look at the trends. With 267,000 searches for “tie-dye” over the past three months and over 1.7 million searches for “‘70s” over the past year on Etsy, it’s official: Tie-dye is back. “2019’s tie-dye uses lighter hues and pastels for a more muted take on the print,” Etsy states. Mid-century modern designs and 19th Century style is here to stay this year. “Shoppers can get the look by adding in luxe textures, geometric patterns and pops of metallics into their homes,” says Etsy. Calling The Hills’ Spencer Pratt; crystals have finally made their way into homes. According to Etsy, searches for “crystals” have skyrocketed, and an increasing number of people are incorporating crystals into their homes as dresser knobs, serving utensils and more. Here’s a surprising stat: Searches for “tiger,” “flamingo” and “animal print” over the past three months have been on the incline, with 602K, 337K and 280K searches, respectively. So don’t be afraid to purchase that animal-print throw pillow for an added punch of pattern on your couch. And here we thought the geometric trend died off. With over 127K searches for “abstract prints,” more spaces are getting a modern, abstract facelift. Add warmth to your space with Southwest-themed decor, from turquoise or sunset-hued decor to natural fabrics. Etsy reports over 1.4 million search for “turquoise”, 138K searches for “desert” and over 83K searches for “sunset” in the last three months. And finally, we have wallpaper. If you’re craving pops of color or patterns in your home, it doesn’t have to be on your walls. Instead, look at more unexpected places, like your cabinets, dressers and staircases. “We’ve seen an increase of 385 percent for ‘peel stick wallpaper,’ over 15,000 searches for ‘floor decals’ and over 19,000 searches for ‘stair decals,’ Etsy reports.